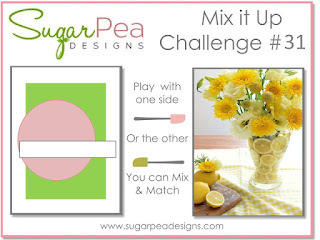 Today is the last day to enter SugarPea Designs Mix It Up Challenge # 31. In case you need some last minute inspiration, here's my card inspired by the sketch. Hi peeps! Just popping in to share this exciting news. All I can say, I am very grateful that I continuously get to work with amazing companies. Am excited for this new opportunity & looking forward to bringing you lots of inspiring & fun projects. Hi peeps! Yay for Friday. 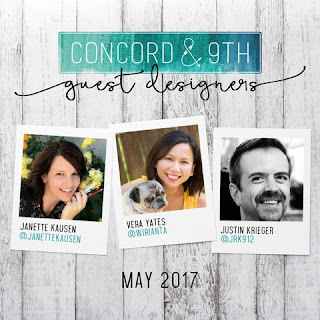 Today, I am back with more fun projects as guest designer for Concord & 9th. This time, we're highlighting the fun Dotty Turnabout set and All About You dies. 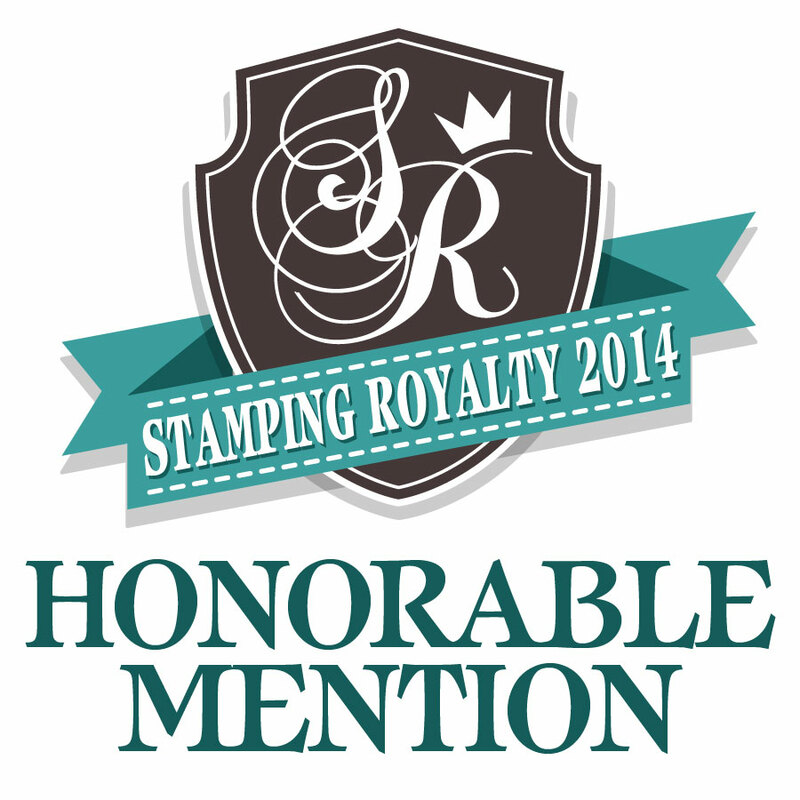 If you haven't tried their Turnabout stamps, you definitely should give it a try! 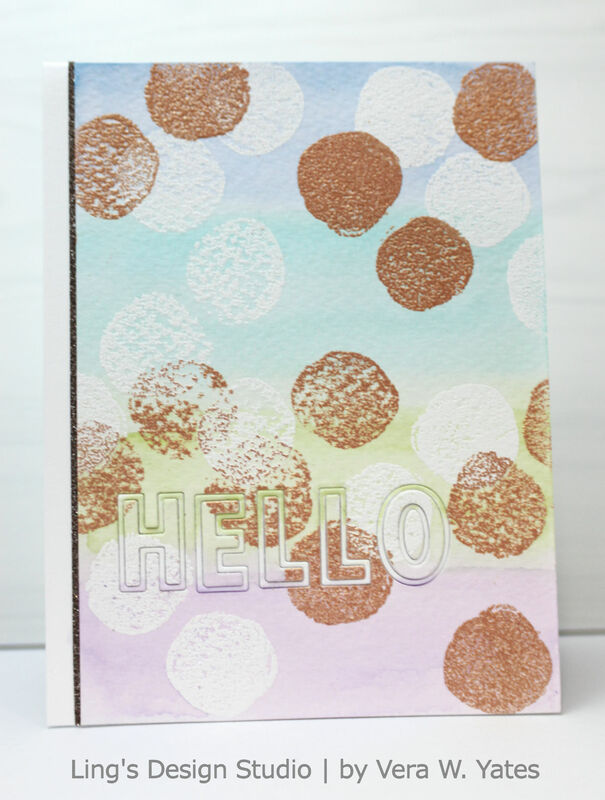 The Dotty Turnabout is their third turnabout set, which allows you to easily create multi-colored backgrounds with just one stamp, one jig, 1-4 ink colors, an Original MISTI™ and a few turns of your paper! 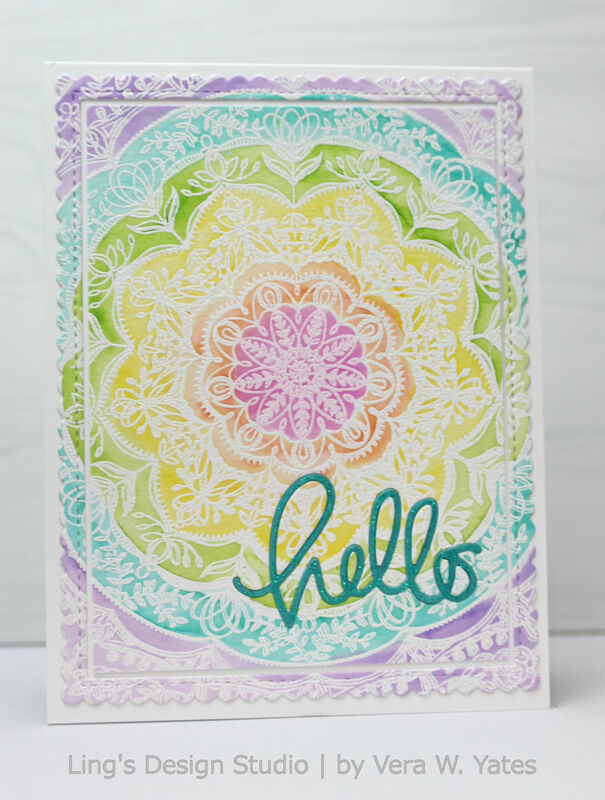 Watch the Turnabout instructional VIDEO to show how to line up the stamp for successful stamping! Here's my 1st card showing the set being used to create horizontal card. How refreshing is this color combo? I feel like it totally conveying cheerfulness. For this card, I only turned my panel three times, thus leaving some white space. And, the fun thing with the dots, you can also stray from the original line up to create a more overlap design. Just make sure you used colors that works together to avoid muddy look when the color overlap. Once I finished stamping the panel, I simply die-cut the word thank you. 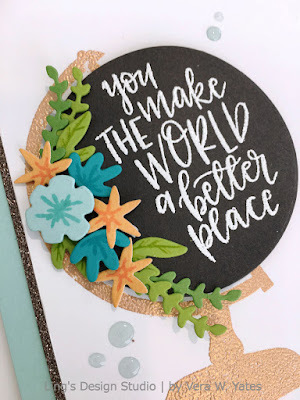 For the word you, I die-cut it once directly on the card panel and once from a gray cardstock for the outline part to make the word you stand out and create good contrast with the rest of the card. Finish the card with a thin strip of glitter paper. For my next card, I went vertical and only turn the panel twice, leaving plenty of white space that I filled with watercolor. 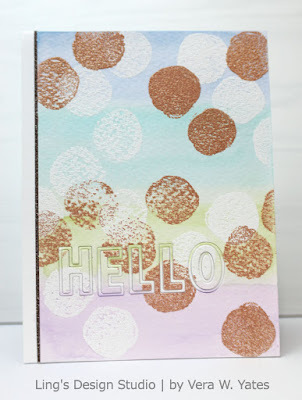 I heat embossed the dots first with white embossing powder and the second time with rose gold embossing powder. Once that done I watercolor the whole panel. 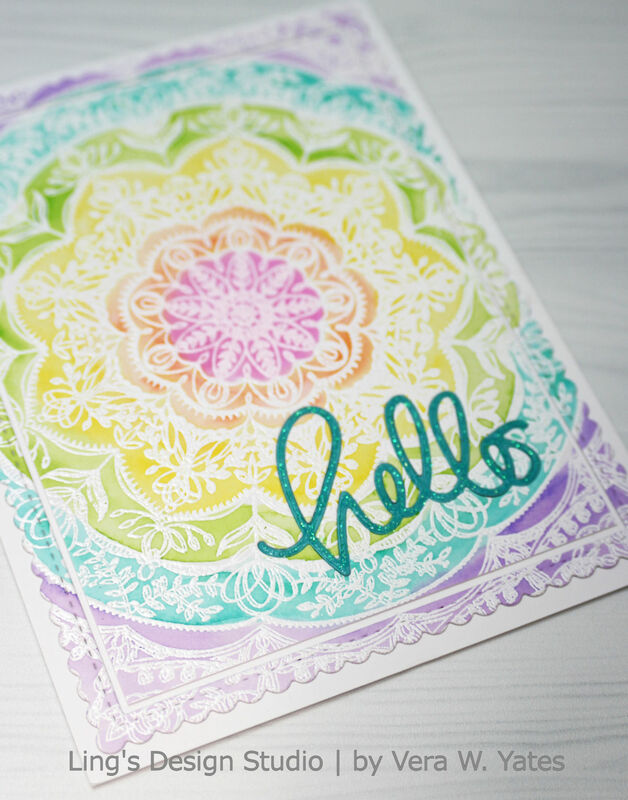 Once it dry, I then die-cut the word Hello using Double-Cut Alphabet Dies. Here's a close up look of the sentiment where you can see the double cut of the alphabets. I really really love this alphabet dies. So versatile & I just love the look. Well peeps, that's all from me today. Thank you for stopping by here and don't forget to stop by Concord & 9th Blog to check out what Janette Kausen and Justin Kriger have created with these sets for more fun inspiration. 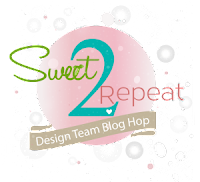 This month, creative wise, it's been quite a whirlwind. With big new releases coming up in June for the companies that I am designing for, that means May is a busy time to create. 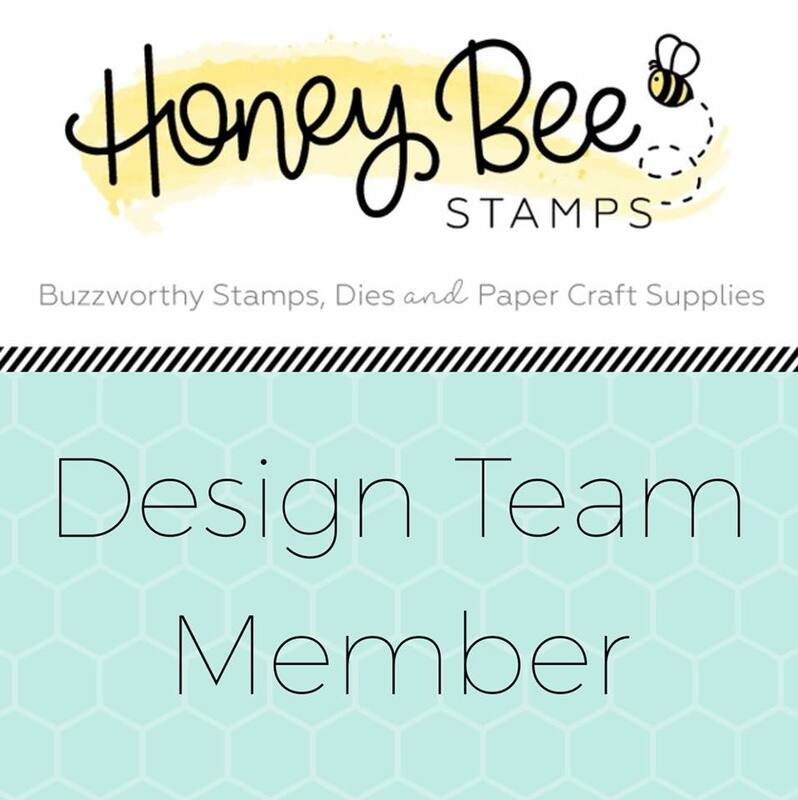 Seriously, I have roughly 33 new stamp sets to work with and that's not counting the several individual stamp for Purple Onion Designs (by the way, if you love cute critter, you'll love Purple Onion Designs upcoming release). Luckily, I find this rejuvenating. I can't wait to share with you all the projects I've been working on behind the scene. Now, on top of that, I am also the recipient of this super cool background stamp from the latest Simon Says Stamp release. 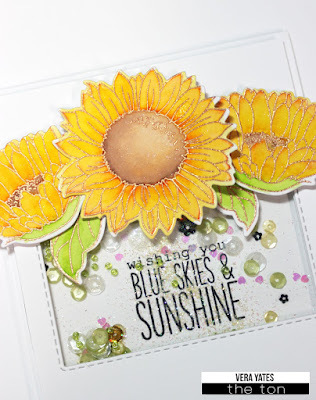 This stamp is part of SSS Cherished collection & it's a blast to play with. Isn't this set is just gorgeous? I simply heat embossed the image on a piece of watercolor cardstock and then colored it with ZIG Kuretake Clean Color Real Brush marker. Once that done & dry, I die-cut the panel using MFT Stitched Rectangle Scallop Edge Frames dies. I trimmed the inside panel a bit more to create white edge all around between the rectangular panel and the scallop frame. Here's a closer look of the card. 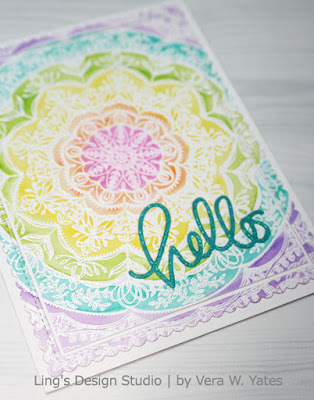 For the hello, I traced it with Tonic Nuvo glitter drop cause... glitter! Hah, I sure love adding glitter to my card. Also, I just want to do quick birthday shout out to my li'l brother, Jerry Aurum. I am blessed with 2 amazing brothers and both of them taught me so much. Jerry, may you have amazing birthday and may the coming year be filled with many blessings. Much love!! Well peeps, that's all from me today. Be back tomorrow with more fun projects for Concord & 9th. See you tomorrow! Hi peeps! How's it going? I am back today with my 2nd showcase for Concord & 9th. I am really enjoying guest designing for them. 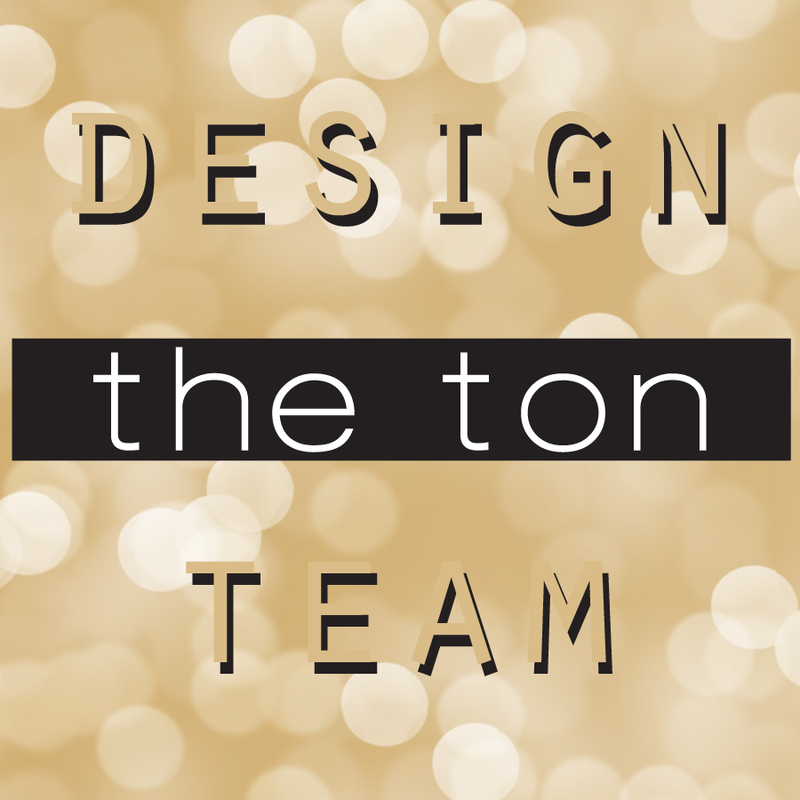 When you get to work with awesome products, that definitely make it easy to create. 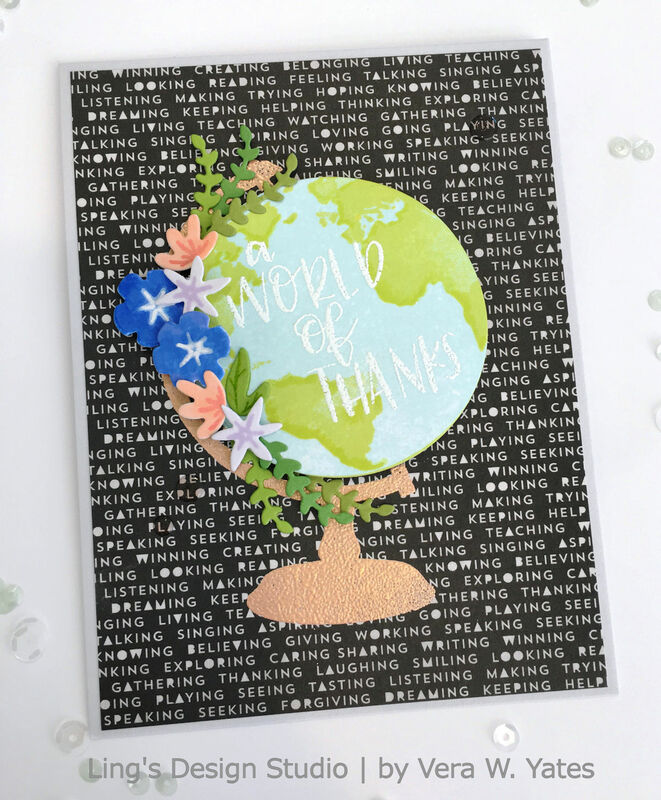 For today, we get to showcase the Globe Greetings set along with Globe Greetings dies set. As someone who loves to travel, I love globe! And, when I saw this set comes complete with some flowers (which is another favorite), my heart was all pitter patter with excitement. Here's my 1st card using tis set. 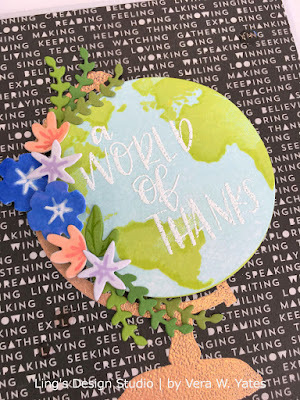 I heat embossed the globe base and the sentiment and then went to town with the flowers. I simply die-cut the flowers from colored cardstock and then stamp the center image of each flowers and adhere some directly on the card and some with pop-dots to create depth. In person, you can see all the layering on this card.Here's a close up look of the globe. Then I want to create a card with more contrasting look. 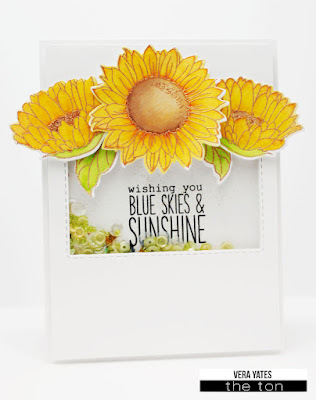 This time I went with black patterned paper as the background and use the bright blue flower as my main focus. Like, literally, I build this card from there. I want to use the bright blue and make everything else work around it. 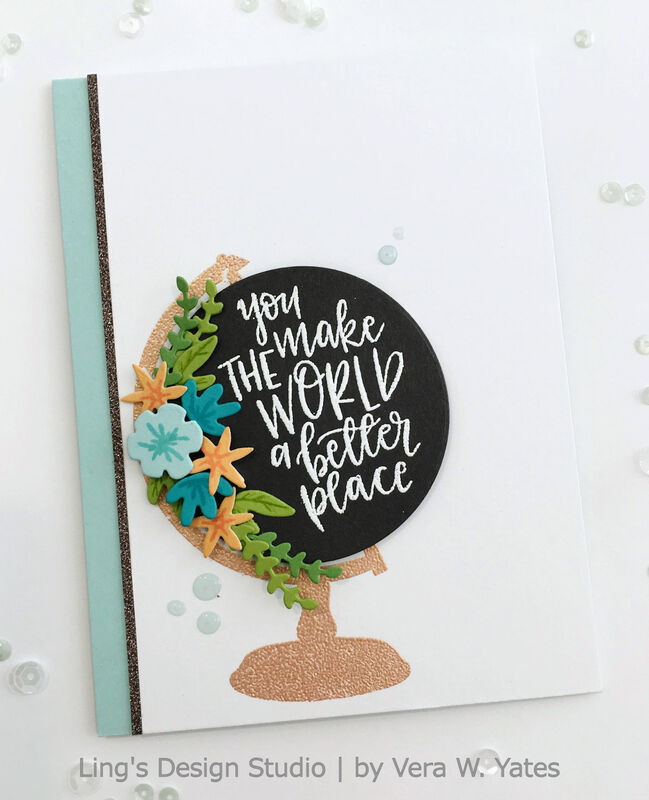 I decided to heat embossed the sentiment in white instead of black to keep the globe design light & airy to complement the bold flower color and the dark background. By the way, you can also get this globe set as a bundle HERE. I am super happy with the way these 2 cards turned out. This set truly combining my love of travel and stamping perfectly. I might have to do one to frame to decorate my new craft room. New craft room? Yep, hubby and I been working on building a new house and it's getting there. Cross fingers everything goes smoothly, we should be moving within the next 2 months and I will have a craft room on the 3rd floor with big window. Not looking forward to the packing, but I am looking forward to new home. It's been hubby's dream to build his own home after building for others for so many years. Will keep you all posted. Hi peeps!! I am back for my 2nd post for today. Surprise!! A few weeks ago, I got this awesome email that asking me if I'd like to guest designing for Concord and 9th. I didn't even have to think of my answer. I love, love, love Concord and 9th and I literally squealed with delight when I saw the email. Keeping it mum was hard!! So, here we are and yes, I am still pinching myself. Can you feel that I am super duper excited? Hah! 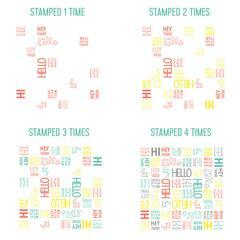 Today, we're highlighting the new Oh, Hello Turnabout stamp set. This set is basically made with a similar concept as their Triangle Turnabout stamp set from previous month releases. I love that with this set you can easily create multi-colored backgrounds. 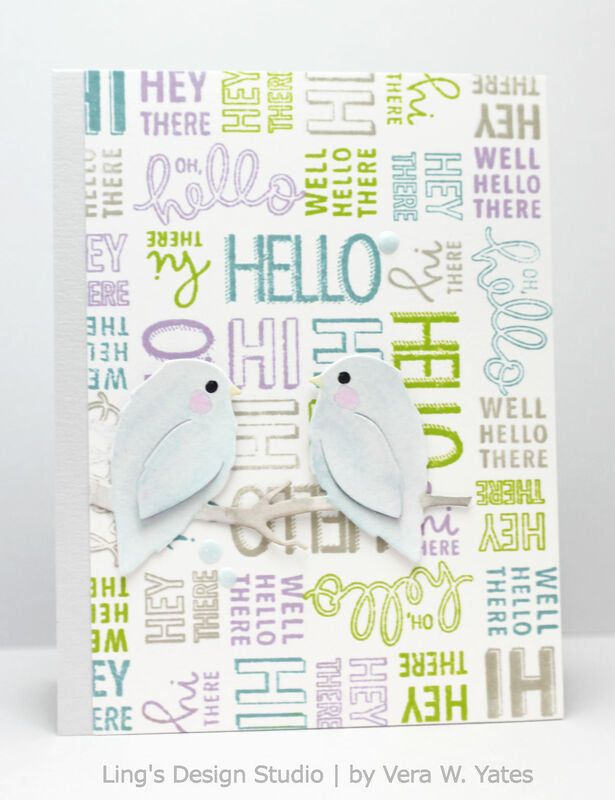 And, there' some extra images on the set, such as "hi there" and "oh, hello there" that you can use to pop-up as a focal point on the card. To see the basic on how to use the Turnabout set, check out the Turnabout instructional VIDEO and it will show you how to line up the stamp for successful stamping! I made 2 cards using this set. Here's my 1st card. I am so glad that I recently upgrade to the original size Misti as it works perfectly with this set. Once I lined up the stamp on Misti I start stamping. First I stamped in teal ink, then rotate my card panel and stamp it again in green, rotate, stamp in purple and on last rotation I stamp the hello with grayish ink pad. I just love mixing color and am loving this color combo. Once I adhere the panel to the card base, I feel like it's missing something, so I decided to add a couple birdies there using Concord and 9th By Your Side Bird Die. I cut the birds from watercolor cardstock, so I can add soft watercolor to them. Once it dry, I adhere them to the card and added some Nuvo enamel dots. I love this set so much, I can't stop at just 1 card. I made another one using one of my favorite color combo. On this card, I went with my usual super CAS style as I want to convey a modern look for this set. This time I only rotate my card panel 3 times and used 3 soft colors. 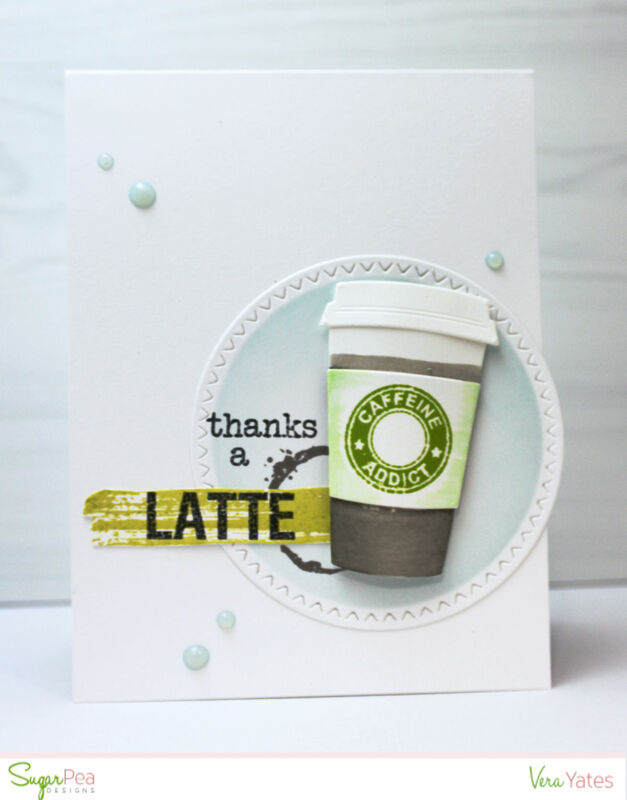 By only stamping it three times, it leaves more white space, which is necessary for clean & simple look. I leave it at that, adhere the panel to the card base (I did pop it for a bit extra oomph) and then simply added a couple enamel heart stickers. This card totally make my inner CAS heart happy. Quite often less is more, right? 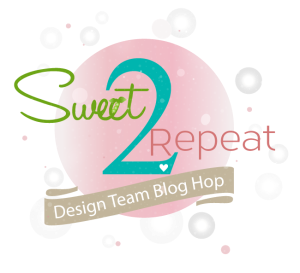 Hi peeps and welcome to SugarPea Designs Sweet2Repeat Blog Hop! 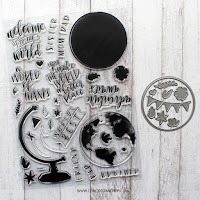 Hopefully by now, many of you have our Spring Release in your crafty stash and we are here to provide you with even more inspiration to showcase more creative possibilities featuring these products! 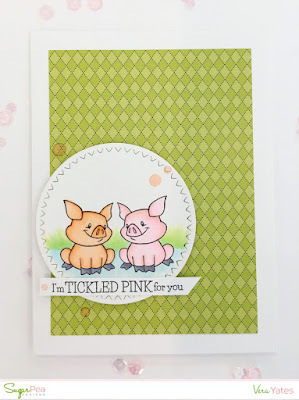 For my card I first watercolor a piece of watercolor cardstock and then die-cut it using SugarCut Breakfast In Bed. 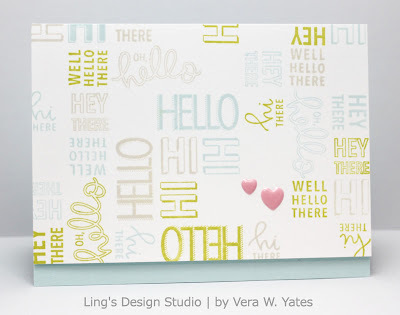 I love the tray in this set and use it to anchor my whole design. 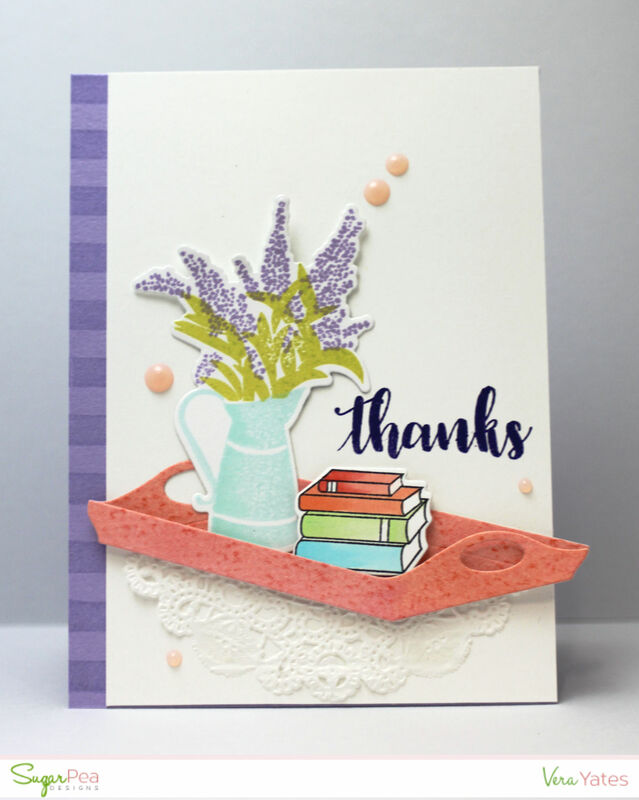 The watercan with flower is from Flowers For Mom set, the book stack is from Class Act and the sentiment is from Terrific Ties set. 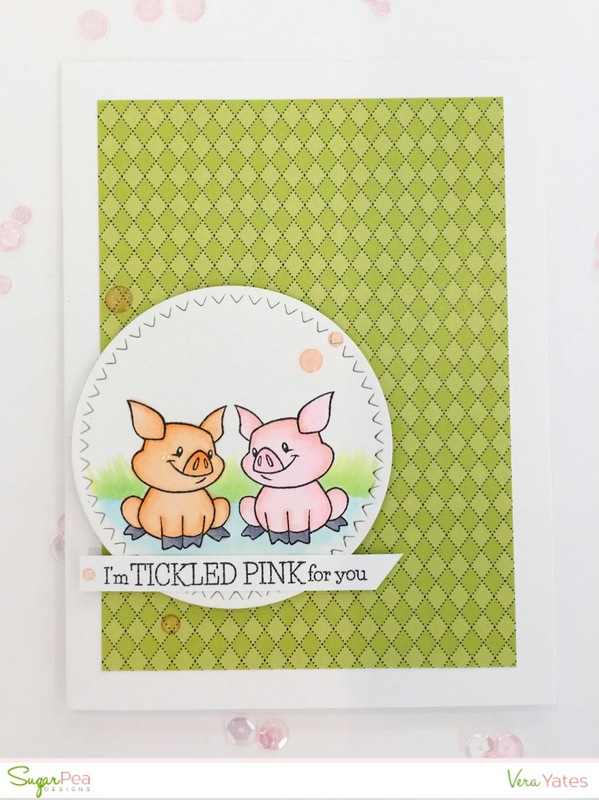 Before I adhere the panel to the card base, I stamped the Striped Background directly on the card base to create a little strip pattern for added interest. I am pretty proud of myself for being able to use 5 different sets on this 1 card. That's pretty rare occasion for me. 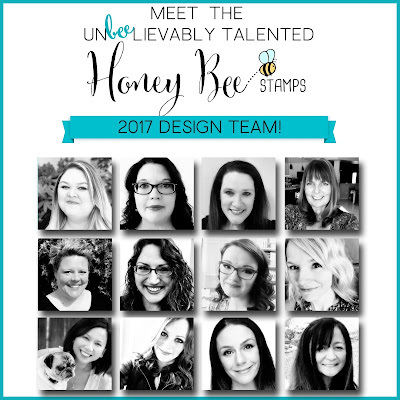 I hope this inspire you to mix and match you stamp sets as that will definitely expand the use of the stamp sets you already owned. Hi peeps. We have new Mix It Up challenge for the month of May at SugarPea Designs! You have all month to play along with us, and each week the SPD team will share some fresh inspiration with their take on the challenge. I hope you'll join us and play along. 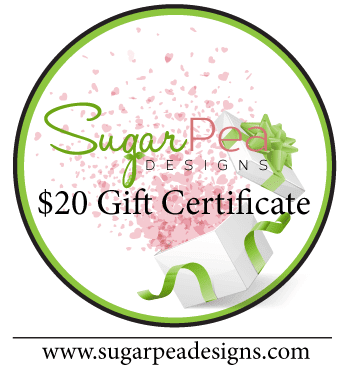 Remember the more times you play along during the month, the better chance you have of winning a $50 gift certificate to SPD store!!! You can find all teh challenge details and enter your card HERE. Last week was quite a week for me and am thankful that this past weekend, I was able to recharge myself. I went to the movie & saw the Guardian of the Galaxy 2 (which I totally love!! ), spent some time on our backyard with the doggies enjoying the beautiful weather and crafting several cards. Being able to sit outside always help me to feel better and I need this recharge as this past week been filled with some sad news. I lost my dear aunt to cancer and it hit me harder than I expected. Also, not being able to go home & be with my family made it even harder. I have several aunts, but this one is very dear to me because we pretty much grew up together. She was adopted by my grandma since she was a baby and she's about 8 years older than me. When my grandma passed away, she joined our family & in a way, she's more like my big sister. The one thing that everyone remember of her is her gentleness. She's such a gentle, thoughtful, kind person. Cancer took her away from us way too early. I mourn her passing. Though, I rejoice that she's now in heaven and free from pain. I am holding on to the memory of our time together. I am grateful to have known her, for her patience with me during my childhood time. She had such a simple view of life, always grateful for what she had, always trying to comfort people. I will miss her dearly & will forever be thankful for the blessing of having her as part of our family. 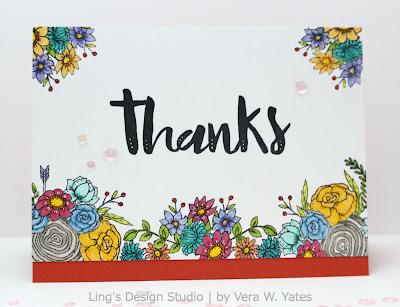 With this in mind, I wanted to create a thank you card. Too often we take the people we love for granted. I want to be better at not doing that. To thank them at random time just because I am lucky to have them in my life. I fell in love with this Honey Bee Hello Gorgeous set from the moment I saw it and I just have to have it. However, it's been sitting on my drawer and it's time to play with it. And, I am so glad that I took this set out. The coloring process was very therapeutic for me. This set is truly a beautiful set & as you know I love playing with flower sets (if you asked me this a few years ago, I probably said differently, hah!!). I am very happy with the way this card turned out. Hi peeps and welcome to May! Can you believe that it's already May? Seriously, I feel like we just celebrated New Year's. Sigh... where did the time go. Anyhoo... with the starts of new month, that means, it's time for new The Ton Stamps challenge. 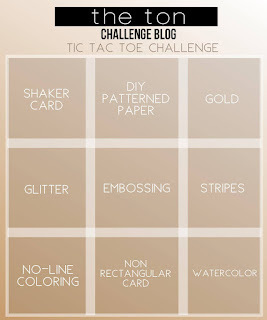 This month we have a fun tic tac toe challenge. Create a project base on any 3 combination across sideway, up and down or diagonally. I chose to combine shaker card, embossing and watercolor for my card. There's just something about sunflowers that always make me feel more upbeat. 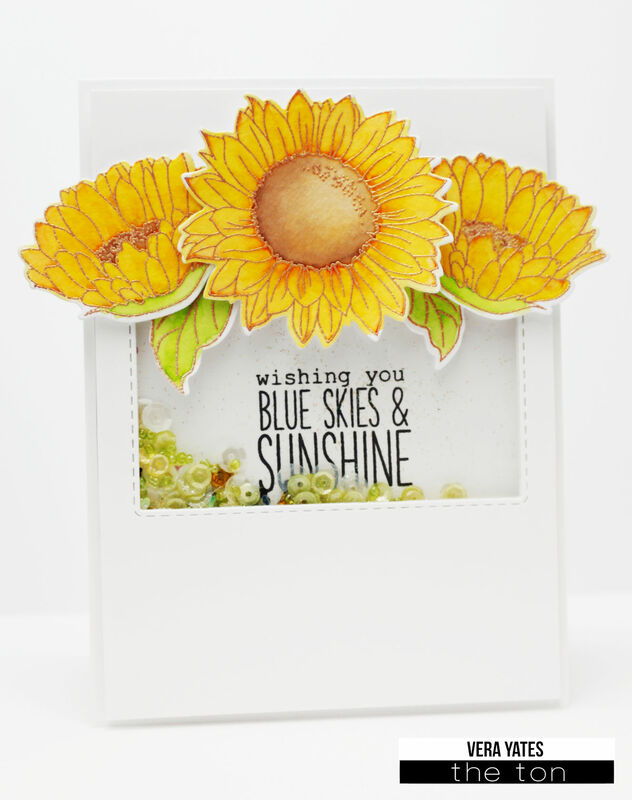 Whether it's the bright coloring or the simple beauty of it, I feel like sunflowers represent sunshine and cheerfulness. Hi peeps. Thank you all so much to those of you who joined our Celebrating Parents Card Drive Blog Hop. 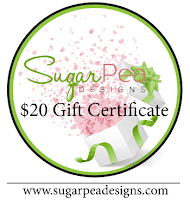 As promised, I am giving away a $30 gift card to the store to one lucky commenter. Congratulations, Karen!! To claim your prize, please contact Altenew at winner@altenew.com by 6/30/2017 with the subject line Altenew Celebrating Parents Blog Hop Winner from ____'s Blog. 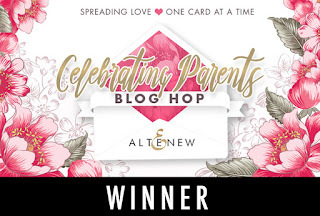 Also, three winners of a $50 Altenew gift certificate will be announced tomorrow, on Tuesday, May 2nd at 5:00 pm EDT on the Altenew blog. We would love for you to use Altenew products, but of course, your cards may use products from any companies! 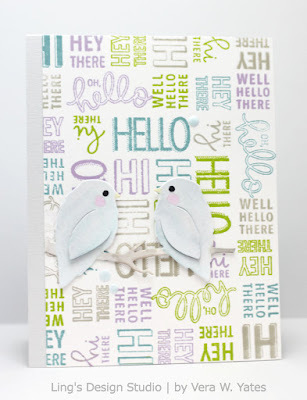 If you have any questions or would like Altenew to send cards to a local shelter or nursing home near you, please email us at support@altenew.com with subject line Celebrating Parents Card Drive.